SAN DIEGO — Have you encountered Sylvia Bate-Swall? I recently enjoyed hearing this vibrant, vigorous 85-year-old speak to Point Loma’s La Playa Trails Association about the Port of San Diego’s history. She witnessed its evolution firsthand, growing up along the water and later as the “supportive spouse” of the visionary John Bate, San Diego’s second port director (also the moving force behind the creation of San Diego’s Unified Port District and construction of Shelter and Harbor Islands and the 10th Avenue Marine Terminal). On most Fridays and Saturdays you’ll find her on the docks at Harbor Island’s Sunroad Marina or on the water, assisting disabled sailors to experience the exhilaration of controlling their own sailboats through Challenged Sailors. Sylvia and her current husband, Mike Swall, rescued the adaptive sailing program, part of Challenged America, several years ago when the organization went bust. They invested their own money to pay dockage and insurance costs for the program’s eight specially designed Martin 16s. Sylvia and Mike became involved with Challenged America in 2003, when a blind friend, Linda Woodward, discovered the organization (shortly after catching the sailing bug while on the Swalls’ 39-foot sloop Kiwi). “Linda asked me to be her ‘eyes’ companion during her sailing with the program,” Sylvia explained. When it foundered they stepped in to save the disabled-friendly sailboats, transferring them to Challenged Sailors, the new organization the volunteers co-founded. “I’m just passionate about Challenged Sailors,” she said. That this generous woman wants to share her love of boating is natural. The only child of a commercial fisherman and boat builder, Sylvia grew up within sight of the water, developing salt water in her veins. Her father built all the family boats, including an early 22-foot speedboat with an inboard engine. “That’s why I’m so water-oriented. I remember my dad helping me build a model boat in the garage when I was about four. My dad taught me to work on things,” she recalled. As a young woman she found herself divorced with two young children and needing a better job. Then an accounting clerk for the city of San Diego, she heard the San Diego Police Department was hiring its first “policewomen.” She applied, took the exam and joined the second wave of women hires, becoming the city’s seventh policewoman in 1956. She went through the police academy as the only woman with 52 men. “The idea of a unified Port District was basically John’s idea,” she explained. John retired in 1966. The much younger Sylvia returned to work as a police officer for San Diego Unified School District. Still, she joined him on two extended voyages through Mexico on their boat. Although they later divorced she remained close to him throughout his life, remaining his strongest advocate and guardian of his Port legacy. She met current husband Mike, a retired Navy pilot and fellow boater, about 40 years ago when he stuck his head under the hood of the truck she was repairing. 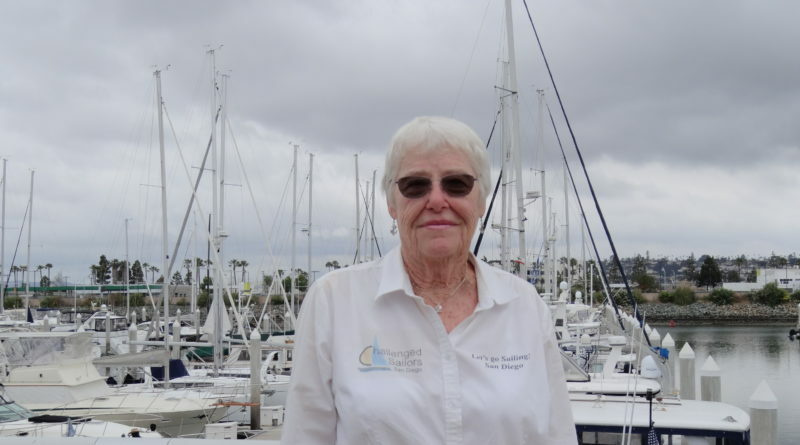 Her life’s highlight, she reports, was the three-month adventure crewing with Mike aboard the 90-foot schooner Bill of Rights, now a Chula Vista museum ship, bringing her from Norfolk, Va., through the Panama Canal for the Los Angeles Maritime Museum. This remarkable, resilient woman knows she’s had a wonderful life, always by the water. ← Easing your boat’s re-entry to the U.S. I am a former Challenged Sailor’s volunteer who helped out with Sylvia. She is a remarkable woman, knowledgeable in her field, and a pleasure to be mentored by.